May 10, 2011 introductory note: After reading and learning more I wrote Côte d’Ivoire – Military Intervention Vs Constitutional Legitimacy, which will tell you a great deal more about what actually happened and what next. It is summarized in the first part of this post: Humanitarian Invasion In Ivory Coast. Gbagbo and company couldn’t manage to do this, indeed the electoral commission that this sitting government had put in place took its job seriously and was remarkably independent – as well it should since a tremendous amount of effort had been put in place by Ivorians and the international community to stage these elections. The resort, then, was to say that the electoral commission did not have the right to declare the results. Which brings me again to that video clip I noted earlier that I’ve been stewing over ever since (… I recommend to everyone their closing line: “the elections have been canceled six times in the past five years.”). I haven’t seen a more perfect piece of political theater in years. Every actor played their part brilliantly. When the next day, the head of the electoral commission did manage to sneak out and declare the results, the Gbagbo camp would remark that the declaration was invalid since it hadn’t been made within the requisite timeframe. In other words, the declaration that could have been made the prior night had turned into Cinderella’s carriage once midnight had passed. First for 15 years ago, you say that a large part of your countrymen are not Ivorians, then you say that they are but that they can’t register, then you delay for 5 years, then you allow only some to register as you then delay registration and again delay the vote. Then the whole country votes and even your folks vote against you so that the opposition win. And now you go and nullify their votes even though most of the irregularities were in your strongholds. Words fail me. There are reports of mercenaries coming in from Liberia and Angola, although the facts are difficult to determine. Ouattara is talking up the tales of mercenaries. He wants military intervention to help him assume office. But that does not mean that some accounts are not true. And some of Charles Taylor’s former cohorts are looking for work, grabbing their wigs and heading to Ivory Coast in hope that either side might employ them. Well, this is a test for the African Union. It’s a test for whether the concept of people’s rights and the idea of democracy will go beyond elections, because in the case of the Ivory Coast, that is called Côte d’Ivoire, we have a situation where the person who has lost the election, Laurent Gbagbo, is refusing to step down. And in the process of refusing to step down, he and those around him, they are invoking all forms of xenophobia and hostility to people from the north in order to divide the country. Thankfully, the days when Liberia, Sierra Leone and Guinea were places that could provide the mercenaries so that Gbagbo could develop war, thankfully, we are in the state of transition in Sierra Leone, in Liberia and Guinea so that the possibility for war will be dependent on the extent to which Gbagbo can get support from persons like Lanny Davis in the United States and the bankers and financial elements within the country that will finance his army. What we have to do in this country, we have, in this country, to call on Hillary Clinton to distance herself from Lanny Davis, who has been employed by Gbagbo to lobby for him in Washington to present the government as a transparent and democratic government. Gbagbo is trying to exploit differences between the State Department and the White House. The President of the United States called Laurent Gbagbo to urge him to step down, and he was so arrogant that he refused to take the telephone call of President Barack Obama. And he is arrogant enough to believe that he can whip up the kind of xenophobia to divide the people of the Ivory Coast to say that Alassane Ouattara is not an Ivorian … the point is, the people voted for him, and the election’s results should be observed. And the positive result out of all of this is the clarity of the African Union, the fact that the African Union is taking a very clear position that Ouattara won the election. The African Union is taking a very clear position that they will use force. And the fact that the meeting of ECOWAS that took place two days ago would send a very clear signal so that there could be no manipulation within West Africa itself, I think this is part of the maturity of the African Union process. And we’re going to need that process also in the Sudan in nine to 11 days’ time, when we face a similar crisis in the Sudan. So, what we in this side of the world have to do, we have to keep up our education to the citizens so that people like Lanny Davis and the State Department and the U.S. Africa Command cannot use incidents such as what is happening in the Ivory Coast to represent Africa as backward and divisive and barbarian. Ivory Coast was a jewel in the crown of French colonialism. The Ivory Coast, by its very name, was a place where colonial plunder took ivory and gold. And the Ivory Coast is located in West Africa, bordered by Liberia, bordered by Sierra Leone, and by Ghana. Now, the president of the Ivory Coast, when Ivory Coast became independent in 1960, the president of Ivory Coast was Houphouët-Boigny. Houphouët-Boigny used the Ivory Coast as a base for counterrevolution in Africa. All of the forces of French colonialism, all of the forces of French exploitation, all of the forces of French militarism converged on the Ivory Coast. And for 30 or more years, the Ivory Coast was the base for supporting apartheid in South Africa. It was a base for supporting Jonas Savimbi. Jonas Savimbi was very close to the leader, Houphouët-Boigny. And some of your listeners would know that they were also complicit in the plot to assassinate Thomas Sankara in Burkina Faso. Now, the fact is, because of the intensification of the investment in the Ivory Coast in that period, in the 50-year period, millions of Africans went to work on banana and cocoa plantations, so that there were a number of people, persons from Burkina Faso, persons from Ghana, Liberia, Sierra Leone and Ghana, who worked in that country. So the country has 20 million persons. There are 10 or a million more persons from north of the country whose ancestors came as migrant workers. Now, in the spirit of pan-Africanism, one should recognize that the borders in the Ivory Coast were artificially created at the Conference of Berlin. Well, in 1993, after Houphouët-Boigny passed away, Alassane Ouattara was the prime minister. They wrote a Supreme Court judgment to say that those who are from the north were not Ivorian citizens, and Alassane Ouattara, whose mother supposedly was born in the Burkina Faso, could not become a candidate for the presidency. Now, between 1999 and 2000, Gbagbo himself ran in an elections, and when he won the elections, the general who was the head of the army said that Gbagbo could not come to power. Gbagbo himself organized so that he could come to power, and there was a civil war in the country between 2000 and 2004, which, again, brought about the intervention of South Africa and the African Union. In that invention, the African Union worked to overturn that judgment of the Supreme Court that said that persons from the north could not be citizens. And this idea is a sentiment that is whipped up in the country called Ivority. Ivority is a chauvinistic notion. It is an anti-pan-African notion. It’s a notion that says only those who are Christian from the southern area of the country can be citizens. Now, this is not something that is carried by the majority of the citizens of the Ivory Coast; this is an idea that is whipped up by the elements of the Ivorian capitalist class. These are Ivorians who have made millions of dollars out of cocoa plantation, out of exploiting the workers in the Ivory Coast. Guy De Lusignan in his book entitled “French-Speaking Africa Since Indpendence”, said … They staked their all on big business and foreign capital. The brilliant potentialities of the country are a challenge and their answer to that challenge is undoubtedly ‘neo-colonialist’ in spirit. During the period of French colonialism and the first three decades of independence (1960-1990),Ivory Coast was promoted to the public as a model for imperialist rule that worked. What the WikiLeaks diplomatic cables revealed was that through successive U.S. administrations, including Barack Obama, the same imperialist aims and objectives determine the character of its foreign policy toward Africa. … U.S. imperialism is strictly designed to further penetrate the economic, political and military affairs of the continent. The threatened intervention by ECOWAS would inevitably translate into large-scale deployments of both Nigerian and Ghanaians troops into Ivory Coast. Such an operation that would place thousands of ECOWAS troops in Ivory Coast would require the logistical support of the U.S. and France. This would place the imperialists in a position to monitor events in Nigeria, with its own political problems of regional and intra-religious conflict, as well as other states including Mali and Sudan. Consequently, anti-war and peace movements inside the United States must oppose any effort by the U.S. to bolster its military presence in Africa by utilizing the Ivorian crisis as an excuse to indirectly invade the country through funding, coordinating and transporting ECOWAS troops in an invasion into the Ivory Coast. Such a course of action could spark even more bloodshed in the West Africa region. The mediation efforts of former South African President Thabo Mbeki provides some hope of resurrecting a political solution to the crisis. Why should their be an ultimatum given to Gbagbo while the other states in the region have been able to work out internal problems through political intervention and negotiations? The United States Africa Command (AFRICOM) over the last year has conducted large-scale military maneuvers on the continent. In West Africa war games have been conducted under the guise of enhancing the security capacity of African states. He is a former International Monetary Fund (IMF) economist. He was deputy managing director of the IMF from 1994 to 1999 and governor of the Bank of Central African States. He [Ouattara] was prime minister of Ivory Coast from 1990 to 1993 and is closely identified with the free market policies introduced under an IMF structural adjustment plan that removed price subsidies and deregulated the labour market. State-owned enterprises were privatized and tariff barriers removed. The economic and social tensions that were ultimately to break out into civil war can be traced in part to the process of economic liberalisation that began in the 1990s. President Félix Houphouët-Boigny, who ruled Ivory Coast from its independence in 1960 until his death in 1993, was able to maintain a degree of stability by sharing patronage among rival sections of the country’s elite. Under his successors tensions became increasingly acute. Falling commodity prices hit Ivory Coast’s chief export of cocoa, and structural adjustment reduced the amount of patronage available. Ivorian politicians whipped up communalist sentiments as they attempted to win a greater share of the country’s wealth for themselves and their supporters. This led to two years of civil war that was only brought to an end by a power-sharing agreement in 2004, which left the country divided. France and the US are eager to see Ouattara in the presidential palace because they see him as the ideal candidate to push through economic measures that will make Ivory Coast the key to developing the entire region as a supplier of raw materials. Their outright backing for Ouattara represents a shift from their previous preference for a power-sharing agreement between the northern, mainly Muslim, and the southern, mainly Christian, Ivorian factions. The New Forces are not thought to be a match for the Ivorian army and would need help from foreign troops if Ouattara were to attempt to oust Gbagbo by military means. ECOWAS seems to be readying itself to do that, in the form of the ECOWAS Monitoring Group (ECOMOG). ECOMOG has previously intervened in Liberia, Sierra Leone and Guinea Bissau. The operation in Liberia was noted for the extent of the looting and corruption on the part of ECOMOG forces, which earned them the nickname “Every Car or Movable Object Gone”. ECOMOG would need logistical and other technical support from the great powers. Their intervention would in this sense be a cover for an extension of more direct colonial authority over Ivory Coast. French defence minister Alain Juppé has said that his country’s troops stationed in Ivory Coast are ready to protect French citizens, but would only intervene directly with a UN mandate. But if Ouattara called on their help as president, they could intervene under a French-Ivorian defence treaty that dates back to 1961. The Financial Times has warned that French intervention would be counterproductive, but with French troops already on the ground this must be one of the most likely outcomes of the conflict over the presidency. 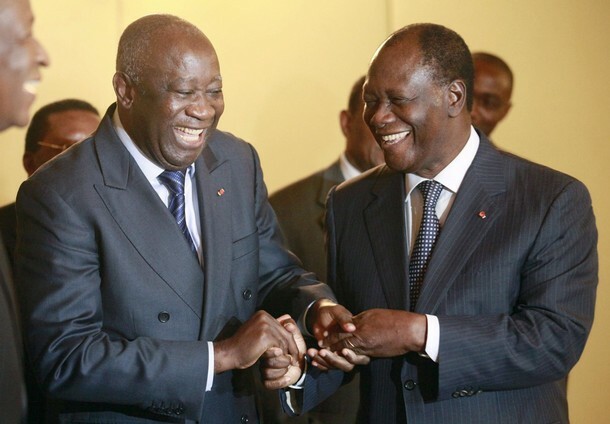 Ouattara’s call for a general strike has undoubtedly followed consultations with his French and US backers. It is uncannily similar to the mass action discussed between Zimbabwean opposition leader, Morgan Tsvangirai, and the US embassy in Harare which has been revealed in the exposed WikiLeaks cables. Tsvangirai agreed to plan strike action for the Christmas holidays when schools, public buildings and many businesses would be closed anyway. The strike call in Ivory Coast is a cynical manoeuvre, intended to give Ouattara some semblance of popular legitimacy, while possibly providing the pretext for a foreign military intervention. If the strikers came under attack from the Ivorian military, which is still loyal to Gbagbo, then an invasion by West African troops with French and US backing could be presented as a humanitarian operation. I think the White House is backing Ouattara. And I’m sure Gbagbo didn’t do himself any favors by refusing to talk to President Obama. Daniel Drezner at Foreign Policy has fantasies of a surgical strike by US special forces citing this BBC report in which Mr. Ouattara is trying to encourage a strike against Gbagbo, saying he could be taken out without starting a civil war or killing Ivoirians. “Legitimate force doesn’t mean a force against Ivorians,” Mr Ouattara told reporters on Thursday, AFP news agency reports. Unfortunately the unwanted person has sometimes been the winner of a democratic election, whose removal the US has engineered or facilitated, as with Aristide in Haiti or Zelaya in Honduras or the failed attempts to oust Chavez using proxies. And the US, in the person of Ambassador Ranneberger, backed Kibaki in his coup against what should have been a successful election in Kenya, plunging the country into violence, then forced a power sharing agreement on the country when the coup was so outrageously obvious and widely condemned that it could not stand. One thing we do know about US policy in Africa, it has relentlessly repeated the same mistakes year after year decade after decade. This includes backing and arming both sides in some conflicts and sponsoring dictators and coup makers, training the militaries that terrorize their people. The present attempts to militarize the continent with the Africa Command, and its shores with seabasing, are just the most recent and vigorous example of this energetic and relentless rush in the wrong direction. It would be fabulous material for comedy if it weren’t so lethal. Ouattara is a free market fundamentalist and practitioner of the zombie economics so favored by the corporate predator state, policies that helped damage the Ivoirian economy and many more developing economies, the policies that are currently bringing down the US economy. He is also the legitimate winner of the election, chosen by the voters in Ivory Coast and all parties should respect that. Of this kind of arrangement [power sharing], Kenya and Zimbabwe point the way to its insufficiency and danger. That kind of arrangement [power sharing] sets up a paradigm for the demise of democracy in Africa. Why must the winner of elections compensate himself by playing second fiddle to the loser of that election? In the Ivorian situation in particular, such an arrangement is superfluous because power-sharing already existed, and the election was conducted to give meaning to democratic rule through the direct franchise of the Ivorian people, and to end the civil war and the unpopular power-sharing arrangement. Of course power sharing can be advantageous to outside predators. It keeps a government weak and divided, unable to properly protect itself, its people, and resources. Ivory Coast’s disputed election may have become Africa’s latest get-out-of-democracy-free card, after the Democratic Republic of Congo, the vast mineral-rich country to its south, announced it wants to revise its constitution to avert a similar fate. The government of Congo, which suffers from a conflict in its east that has displaced more than 1.4m people in the past 18 months alone, said this week it would seek to do away with a second round in presidential elections due to be held this year, a move many regard as a pretext for an early victory for Joseph Kabila, the incumbent president. I don’t know what will happen next. Gbagbo’s position is untenable. I don’t think military intervention is a good idea, see many of the arguments above. Although I do understand the arguments for an ECOWAS intervention. If military intervention occurs, there are certain to be ugly unintended consequences, ugly consequences that should be anticipated, and some ugly consequences that are intended. It should be possible to use pressure and diplomatic negotiation to resolve the situation. Keeping talking, and talking, and talking more is about the only way to resolve issues where the parties are determined not to compromise. Côte d’Ivoire – Military Intervention Vs Constitutional Legitimacyfor more information on exactly what happened and what it means going forward.